Phytopet Bladder and Urinary tract support. Fast acting, Liquid Botanical Extract for ease of administration, no fighting to give tablets. Concentrated, only requires a small drop amount. Just add to food or drinking water. Hydranger (Hydranger arborescens): A traditional remedy for urinary calculi, and other urinary tract discomforts. Bearberry (Arctostaphylos uva-ursi): A renowned urinary antiseptic, specifically indicated for acute urinary tract discomforts. Horsetail (Equisitum officinalis): Traditionally used for urinary tract disorders due to its soothing healing action. Rich in silica which aids tissue repair and helps to preserve the elasticity of connective tissue. .
Yarrow (Achilia milliflorum): Diuretic and urinary antiseptic. Promotes perspiration, thus, reducing fevers. 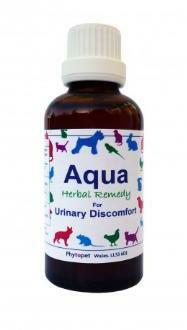 Traditionally used in any mix for urinary and kidney disorder. Cramp Bark (Vibernum oppulus): A good muscle relaxant aiding the spasms associated with urinary calculi and bladder problems.